Sometimes we might offend or sin against friends and family, and if this happens Christians are to confess our sins to God, and apologize to that person. Everything we do must be sincere. A true friend would fix their relationship with others and pray for others instead of keeping pride and stubbornness in their hearts. Don’t let guilt linger in your heart. 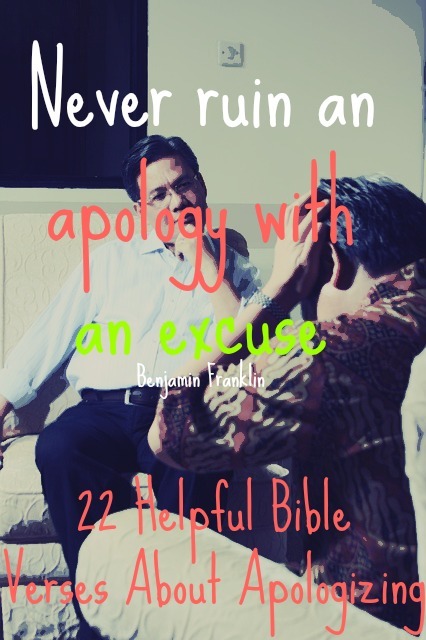 Go apologize, say I’m sorry, and make things right. 1. Psalm 51:3 For I know my transgressions, and my sin is ever before me. 2. Matthew 5:23-24 So, what if you are offering your gift at the altar and remember that someone has something against you? Leave your gift there and go make peace with that person. Then come and offer your gift. 3. James 5:16 Confess your sins to each other and pray for each other so that you may be healed. The earnest prayer of a righteous person has great power and produces wonderful results. 4. 1 Peter 4:8 Most important of all, continue to show deep love for each other, for love covers a multitude of sins. 5. 1 Corinthians 13:4-7 Love is patient and kind. Love is not jealous or boastful or proud or rude. It does not demand its own way. It is not irritable, and it keeps no record of being wronged. It does not rejoice about injustice but rejoices whenever the truth wins out. Love never gives up, never loses faith, is always hopeful, and endures through every circumstance. 6. Proverbs 10:12 Hatred stirs up conflict, but love covers over all wrongs. 7. 1 John 4:7 Dear friends, let us continue to love one another, for love comes from God. Anyone who loves is a child of God and knows God. 8. John 15:13 Greater love has no one than this, that someone lay down his life for his friends. 9. Proverbs 17:17 A friend loves at all times, and a brother is born for adversity. Saying I’m sorry shows maturity. 10. 1 Corinthians 13:11 When I was a child, I spoke like a child, I thought like a child, I reasoned like a child. When I became a man, I gave up childish ways. 11. 1 Corinthians 14:20 Dear brothers and sisters, don’t be childish in your understanding of these things. Be innocent as babies when it comes to evil, but be mature in understanding matters of this kind. 12. Ephesians 4:32 Be kind to each other, sympathetic, forgiving each other as God has forgiven you through Christ. 13. 1 Thessalonians 5:11 Therefore encourage one another and build one another up, just as you are doing. 14. 1 John 1:9 If we confess our sins, he is faithful and just to forgive us our sins and to cleanse us from all unrighteousness. 15. Romans 14:19 Therefore, let’s keep on pursuing those things that bring peace and that lead to building up one another. 16.Romans 12:18 If possible, so far as it depends on you, live peaceably with all. 17. Psalm 34:14 Turn from evil and do good; seek peace and pursue it. 18. Hebrews 12:14 Make every effort to live in peace with everyone and to be holy; without holiness no one will see the Lord. 19. Proverbs 14:9 Fools make fun of guilt, but the godly acknowledge it and seek reconciliation. 21. Matthew 6:14-15 For if you forgive others their trespasses, your heavenly Father will also forgive you, but if you do not forgive others their trespasses, neither will your Father forgive your trespasses.